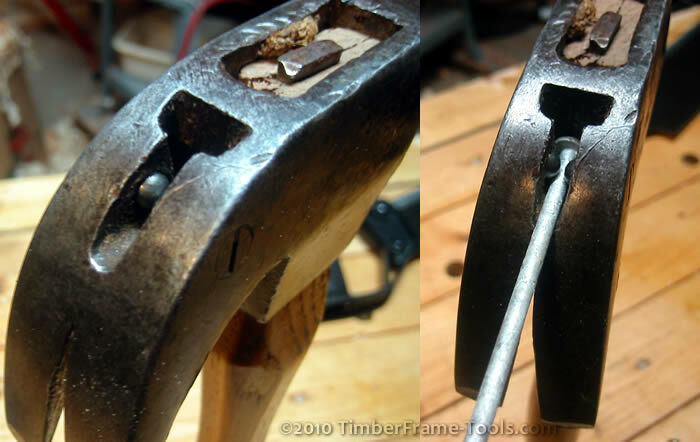 I wrote a while back about my Grandfather’s Belknap Bluegrass Hammer so now I turn my old tool spotlight to my Father’s Cheney Bell Face Hammer with the very cool and functional ball bearing nail holder. 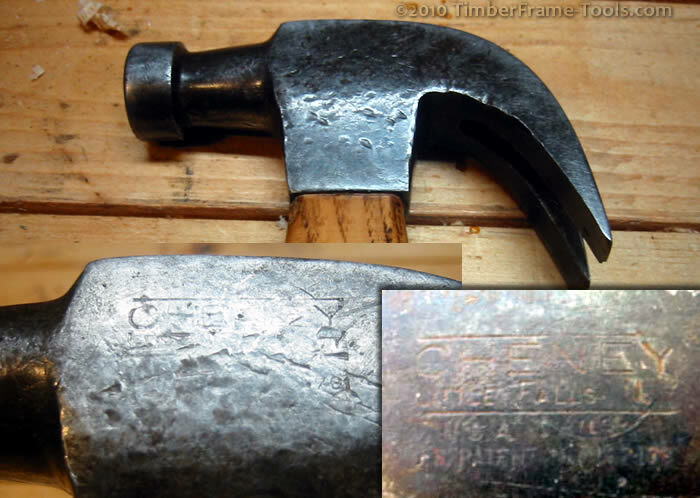 This hammer was made by the Cheney Hammer Co. in Little Falls NY. The Cheney mark has almost been wiped out on my Dad's old hammer from too many side blows in tight spaces. The mark show on the right is what it should look like, complete with the patent number. 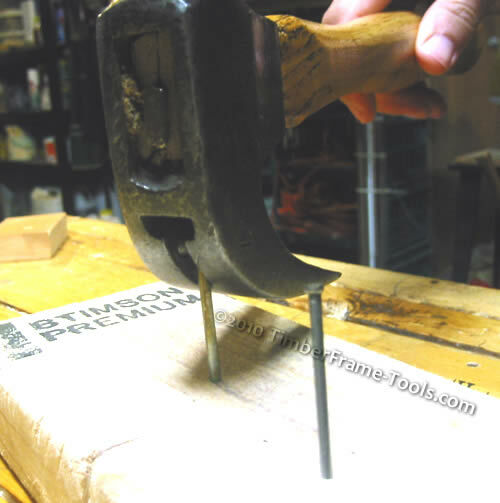 The nail holder was intended to allow you to place a nail in it, swing the hammer firmly and start the nail on its way without having to get your fingers in the way. 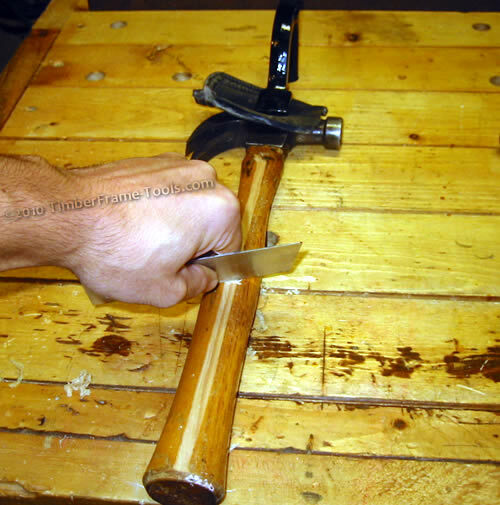 A pair of spring loaded ball bearings hold the nail securely, but release it easily once the nail is initially sunk into the wood. The nail holder works for a large variety nails as long as the nail is long enough. It can start finishing nails but without the head on them, they aren’t very accurate, so it is best suited for box and framing nails. With a single swing, the nail holder will drive the nail in securely and safely. Why this nail holder didn’t make it onto modern day hammers I do not know. It seems to hold up just fine through the years and offers good service. Of all the other Cheney hammers I have seen, I have yet to find one with a ball bearing missing or frozen from rust. That leads me to believe the mechanism is reliable. I am glad I have my dad’s and can continue to use it. Since it is better suited for framing, I do wish it was a little heavier. I know from the patent that the hammer was made some time after 1927 but before 1954 when the Cheney Hammer Co. was sold and moved from Little Falls NY. About a decade ago I put a new handle on it after the original (not sure it was original) broke. The handle I put on was a simple oval replacement from the hardware store. It was pretty similar to the ones I’ve seen with original handles on them. Since I am more fond of the handle on my Grandfather’s hammer, I set out to make this handle a little more octagon in shape. To do this I secured the hammer and started making flats on the handle in the arrangement of an octagon. I made the flat facets first with a card scraper. The original polyurethane on the handle allowed me see how wide the flats were getting. After the flats were made I used the card scraper lightly to remove the little stripes of finish that remained between one facet and the next. A card scraper has the effect of following the curves that make up the length of the handle, while flattening the curves that make up the radius. A plane would have flattened both. I rubbed the handle down with a gray scotchbrite pad to round out the transitions from one flat to the next and then wiped on a few coats of shellac with just a splash of boiled linseed oil mixed in. Here is the progression from left to right (oval, shaped to octagon, finished). The octagonal facets don't show up well in the photo, but are easily noticed when picking up the hammer. Henry Cheney was born in Otsego NY in 1821. He was granted a patent for hammer head design in 1867 that related to combining a cast iron handle socket with a wrought iron head – Patent No. 66298 (pdf). On July 4, 1871 he was granted a patent for a nail holding provision in a claw hammer that used the claw and a notch to hold the nail while it was started – Patent No. 116553 (pdf). As described earlier, the patent for the ball bearing nail holder was granted to Arthur E. Taylor in 1927. Patent No. 1621761 (pdf) and it is that patent that is used for the rather famous “Cheney Nail Holding Hammer”. 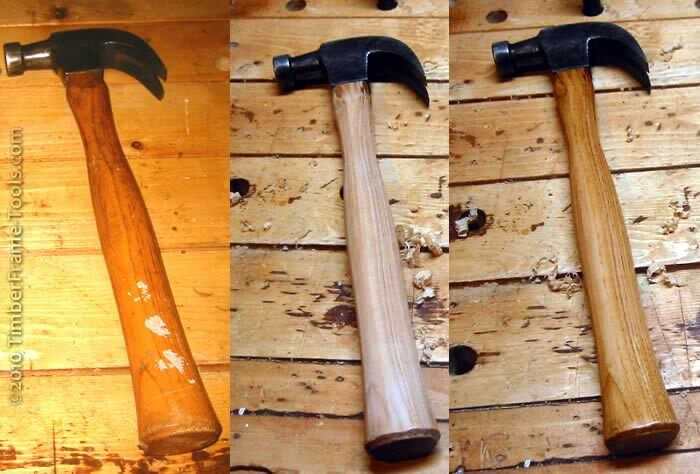 Jay, congratulations on acquiring a new old hammer. I’ve used the hammer with the magnet and divot sometimes it worked well, sometimes it sent the nail flying off with a Piiiiinnnngggg. My Cheney has never launched a nail like that. Enjoy your Cheney.